Clay Aiken – It Takes Balance And Hard Work! Have you heard about the hundreds of young athletes that are in Missouri this week? The 2017 Prudential U.S. Figure Skating Championships are being held Jan. 14-22, 2017, in Kansas City and Independence, Missouri. The championship and junior skaters are competing at Sprint Center in Kansas City and the younger skaters compete at Silverstein Eye Centers Arena in Independence. About 400 of the top athletes in the United States are in Kansas City to compete for U.S. titles over 9 days of competition. The U.S. Championships will feature competition in five levels (juvenile, intermediate, novice, junior and senior) and in all four disciplines of the sport: Men, Ladies, Pairs and Ice Dance. The U.S. Championships serve as the final qualifying competition before U.S. Figure Skating names the 2017 U.S. World Figure Skating Team, 2017 World Junior Figure Skating Team and 2017 Four Continents Figure Skating Team. Team USA will send three ladies, two men, two pairs teams and three ice dance teams to the 2017 ISU World Figure Skating Championships, March 29-April 2, in Helsinki, Finland. I am an avid figure skating fan and have enjoyed watching the event on my computer at icenetwork.com This site is providing live and on-demand coverage from Kansas City. I love watching the juvenile and intermediate skaters. For most of them, this is their first Nationals and I am always amazed at how well they perform. Today, the senior competition starts at 5:30pm. Some of the events will also be shown on NBC and NBCSN. 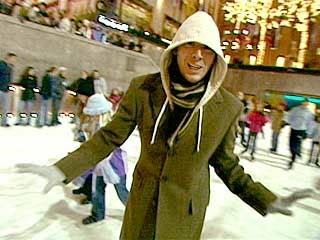 As I watch, I can’t help but think about Clay Aiken and his escapades on the ice. The first time I heard about Clay on the ice was on December 21, 2003. Called Skate With Clay, the Bubel/Aiken Foundation and the Carolina Hurricanes sponsored a great afternoon of skating. Clay spent the afternoon at the RBC Center, ice-skating with 100 children from the local area. The purpose of the event was to mingle children with and without special needs together. It gave them the opportunity to learn from each other and make new friends. 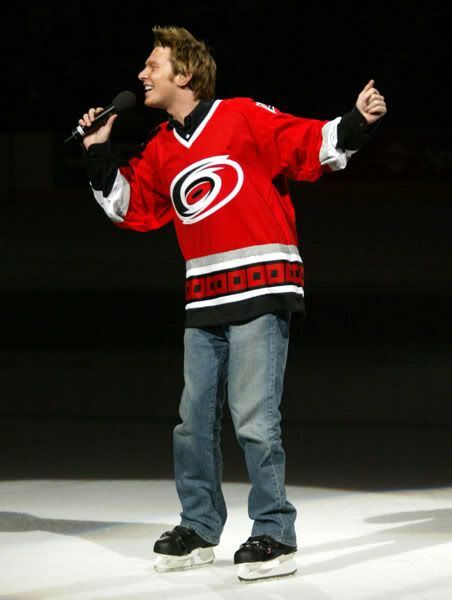 The next evening, Clay performed at the Carolina Hurricanes/Dallas Stars Hockey game. After singing the Star Spangled Banner, Clay entertained the crowd with a short concert. The highlight of the evening occurred during the first intermission. Seemingly without any concern, Clay took to the ice and sang “I Will Carry You” as he skated around the arena. Besides sounding wonderful, Clay skated with confidence and got a huge round of applause. Clay made a quick appearance on ice at Rockefeller Center. When he was in town for the Christmas Tree Lighting, Clay tried to get in a short skate. He probably hoped he wouldn’t get caught, but……he did and we got some cute pictures! The next time we saw Clay on the ice was in Las Vegas on November 6, 2007. Clay was tapped to be the exclusive musical guest on “Capital One Holiday Celebration on Ice.” Clay was joined by many World and National champions as they celebrated the holiday season. The program was broadcast on TV on Christmas Day. At that time, the audience got to see some back stage film of Clay getting a skating lesson from Olympian Sasha Cohen. The program ended with Clay joining the skaters as they took their bows by skating around the arena. It looked like Clay was having a great time. 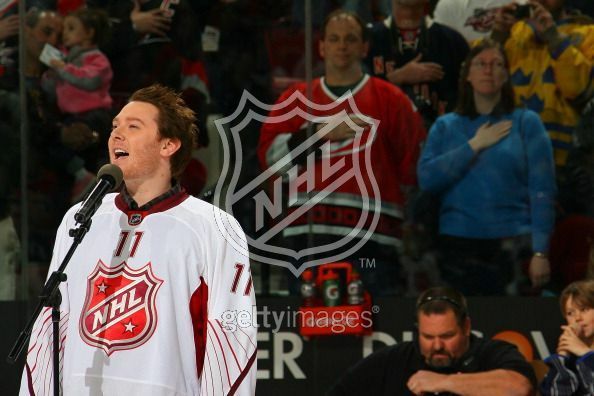 Clay sang the National Anthem at the NHL All Star Game on January 30, 2011. The game was held in Raleigh, NC. I wonder if Clay has been skating recently. He looked so at ease on the ice and seemed to have a good time. I hope you will all take the time to watch this touching video. It is beautiful! Are you watching the US Figure Skating Nationals?? Did you see any of the skating events that included Clay? I love figure skating! Ballet on Ice! Clay was wonderful and hope he continues ice skating! Thank you CANN for sharing the Claymemories! I wonder if Clay ever goes to Rockefeller Center to skate now that he lives in NYC. He did such a great job with the kids back in 12/03. I will be watching the figure skating too. I have been a fan for years. It is also fun to see Clay on skates. His Skate With Clay was a super idea. I love figure skating. Thanks for letting us know about Nationals. Error: Error validating access token: Session has expired on Tuesday, 21-Aug-18 16:13:01 PDT. The current time is Thursday, 25-Apr-19 23:23:09 PDT.